Missing a few with flu, but the show goes on. The water was 8.9ºc on Saturday morning as Spring continues. It was over 9ºc a couple of afternoons last week. 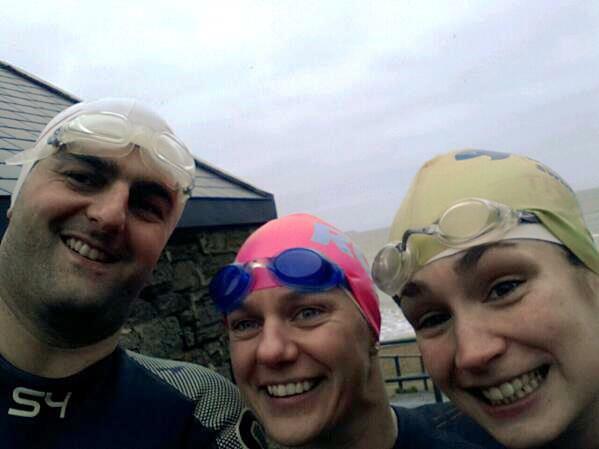 Carol Cashell arrived for her first sea swim in eight weeks and brought Orla Houlihan with her to keep Gary company. Aiming for Thursday at 4.30pm this week and Saturday at 08.15. Forecast looks great. This entry was posted in Information, Swimming Times and tagged Open water swimming - Cork, Open water swimming - Cork - Ireland, Sea swimming - Cork, Sea Swimming - Cork - Ireland by myrtlevilleswimmers. Bookmark the permalink.